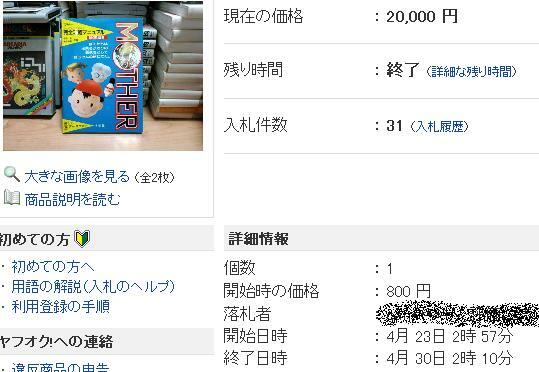 I’m not too much of an expert on Japanese MOTHER series guides, so it was a surprise when I learned one sold on Yahoo Auctions Japan a few months ago for 20,000 yen – or about $210! Apparently it’s a little rarer than the other guides, which is something I never really realized until now. It looks like this particular guide had 31 bidders, so at least a few people were fighting over it. Actually, does anyone have any pics or scans of this particular guide? I’d love to know more about it! This also reminds me that although EarthBound/MOTHER stuff usually sells for crazy amounts here in the West, sometimes crazy auctions happen in Japan too! I never thought that any Mother merch would sell for that much in Japan. It never saw a Mother 2 guide on Ebay and now I know why. I agree with Apple Kid. I’d love to have a Mother guide, even if it is in Japanese.